Yeah, I’m one of those parents. The kind that actually pays his kids to fill their minds with good stuff. I pay my kids to read personal development books. Call me weird. I’ve seen normal out there and believe me – we consider “weird” to be a compliment around our house. I started this a few years back with the older ones, with mixed success. After all, every kid is different. But I realized pretty early on that I only have a precious few years to “preload” the little cherubs with as much positive reinforcement in their ever-growing minds as I can. Before they are bombarded with voices that no-so-quietly tell them that “it can’t be done” and “you only live once” and “don’t work too hard,” I’m out to help them lay the foundation of “I can do anything” and “make each day your masterpiece” and “live like no one else so that later you can live like no one else.” From where I’m sitting, it appears that I’m getting a real bargain for my money. I have a huge list of books that I will actually pay my kids to read. Different books are of course appropriate for different ages. In our home, the participation in the program has always been voluntary. One summer, when my daughter Jordan was 13, I gave her a list of a dozen books with a tiered pay structure. Depending on what she read, Jordan had the ability to net nearly $300 over the summer that year. She didn’t read everything on the list, but she did choose a few titles and was able to earn extra money for the “cool clothes” that she wanted to start the new school year with. I’ve been asked before how I confirm that the books are actually read. Early on, I used to request a one-page book report. Now, I think an hour of dialogue with my kid about what they learned is worth so much more. Just sitting with them out on the patio, talking about the story, the lessons, and what they took away from the reading shows me everything I need to know about their comprehension and ability to translate what they read into personal application. With summer vacation in full force, I encourage you to consider trying this with your kids. While I could list many, here are five personal development gold mines that I would recommend in a heartbeat for summer reading. The target ages I’ve provided are mere guidelines; feel free to customize your own plan to the abilities and interests of your own child. 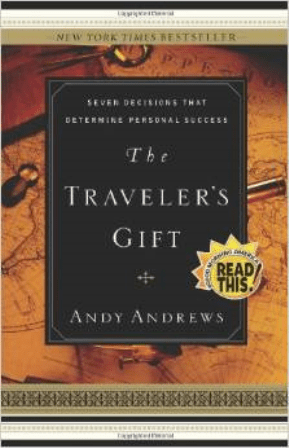 The Traveler’s Gift, Andy Andrews (2005, Thomas Nelson). This is clearly one of my favorite books of all time, and I know I’m not alone. It’s the book that launched Andy Andrews onto the bestseller lists and has kept him there for some time. In The Traveler’s Gift, we get to follow a desperate and near-suicidal David Ponder as he crashes his car on an icy road and is suddenly transported to another place and time. Throughout the book, David continues to “travel” during time periods and visits several famous historical people (I won’t spoil the fun by telling you who they are, but the conversation that happens in “the place that never was” gets me every time). Each person is expecting David and has prepared a life lesson in written form for him to take along on his journey. I think Andy Andrews hit a gold mine when he figured out how to combine life principles for success with a little history and biography thrown in for good measure. If for any reason you haven’t read The Traveler’s Gift yourself, run out and get it today. Target age: 12-years old and older. 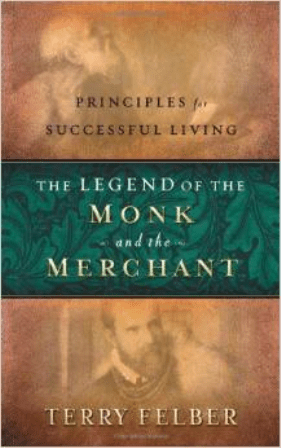 The Legend of the Monk and the Merchant, Terry Felber (2005, World Publishing). I had originally given my older boys The Richest Man in Babylon by George S. Clayton to read a few years back. At the time, I loved the way it taught sound money management in an allegorical story format. Since then, I’ve discovered The Legend of the Monk and the Merchant, and I consider it to be even better. For one thing, I think it’s easier for kids to read and digest. In addition, the protagonist is a kid himself – a young boy named Julio. As readers, we get to listen in as Julio travels with his grandfather Antonio through Italy and learns the secrets of money management as Antonio shares the stories and secrets of his own youth. If you want your kids to be exposed to the principles of careful money management, saving and charitable giving, along with the risks that come with borrowing and over-commitment of one’s resources, this book can be a great tool for you. Target age: 10-years old and older. 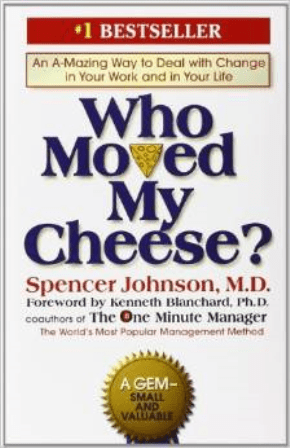 Who Moved My Cheese?, Spencer Johnson (1998, G. P. Putnam’s Sons). When I told my wife Gina that Who Moved My Cheese? was going on this list, her first response was, “Isn’t that a business book? Why would you recommend that for kids?” Great question. If you’ve ever been asked to read the book at your place of business, or even on your own, you may not ever have realized that this book was written at the 6th grade reading level. In fact, I think that it’s the simplicity of the story itself that drives its central point home. In this wonderful tale, we get to follow two mice, Sniff and Scurry, as well as two “littlepeople” named Hem and Haw. Throughout the short story, we get to follow the travels of these four characters in a maze as their “cheese” has been moved. As each character decides how to deal with the unexpected change in their world, we as readers learn our own life lessons about change and how to handle and adapt to it. While Spencer Johnson wrote this little tale for the business community, it’s still a great tool to use when teaching your kids to embrace change and to look for new and creative ways of problem solving. If you’re considering trying for the first time any sort of “read for pay” program with your kids (especially younger ones), this may be a great starter book for your family. Target age: 9-years old and older. 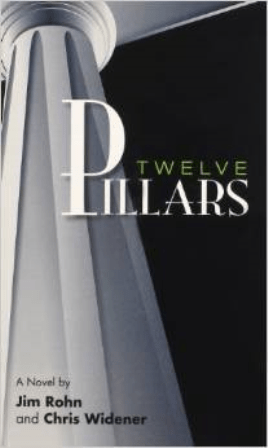 Twelve Pillars, Chris Widener and Jim Rohn (2005, Jim Rohn International). This is a great book not just to pay your kids to read, but it also works well as a graduation gift, a gift for nieces and nephews, etc. It’s a book I wish I had written. When Michael Jones’ car breaks down on the side of the road, he ends up seeking help at a rather large estate that we find out is named Twelve Pillars. As readers, we get to watch Michael begin to form a long-lasting relationship and bond with an elderly caretaker named Charlie, who manages Twelve Pillars for the elusive and never-seen Mr. Davis. As Michael returns for multiple visits, Charlie shares with him certain “life lessons” that have brought Mr. Davis his success over the years. The lessons – such as the power of life-long learning, managing time properly, surrounding yourself with the right people, etc – leap off the page in a format that is both fun and easy for our kids to understand. If you were to choose only one book from this list, I would highly suggest making it Twelve Pillars. Failing Forward, John C. Maxwell (2007, Thomas Nelson). This is the only non-allegorical book on this list, and for that reason it’s probably better suited to older kids. I think that teaching our kids how to deal with and overcome failure is crucial today – perhaps more than ever. In our ever-changing, “everybody gets a trophy” society, I think our kids need a book like this to offset all the mixed messages they are getting. In the adult world, there are layoffs. Businesses fail and close their doors. Relationships take real work and don’t always survive. This book is basically a case study in pressing on. 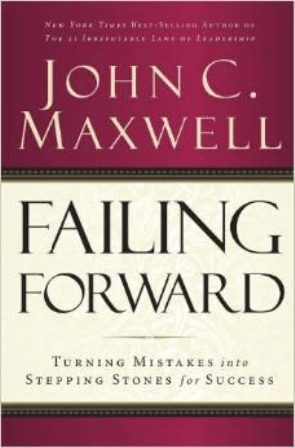 In Failing Forward, John C. Maxwell shares the stories of several well known public figures, who ended up using their experiences of failure to teach, grow and propel them to eventual success. As your older kids are getting the inside scoop on people like the Wright brothers, James Audubon and Mary Kay Ash, they are being exposed to example after example of individuals who placed their belief in their own ability above temporary setbacks. After all, who of us doesn’t want that for our kids? Target age: 14-years old and older. Do you have any personal development books that you love and have passed on to your own children? Do you have another book to add to this list? If so, please comment below and tell us!